Looking For Group - LFG Vol.10 and More! Just a quick note to let you know that LFG Vol.10 is now available in the shop! So, if you missed the kickstarter, you can now add the latest tome to your library! 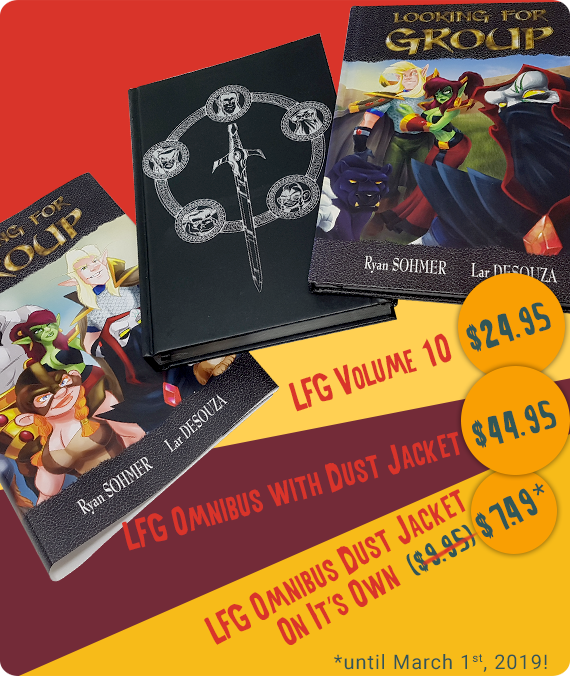 Well, as part of the LFG 10 Kickstarter, we designed a dust jacket to put on the Omnibus in order to satisfy the need to have them all look uniform! This too is available in the shop and is at a special 25% off price until March 1st. You can get the Dust Jacket on it’s own, or with a copy of the Omnibus! So there you go, friends! Act now and act well!